Lidl, the German supermarket chain, has expanded into Georgia with three new stores in Metro Atlanta. Lidl, which is rhymes with “beetle,” is based in Germany and has more than 10,000 stores in 28 nations. Lidl is known as a discount grocer, focusing on stores with a small footprint. But the chain is marketing itself in the U.S. as the place for top quality items at the lowest price. Two stores are in Cobb County, where InSite Street Media has a large street furniture presence. 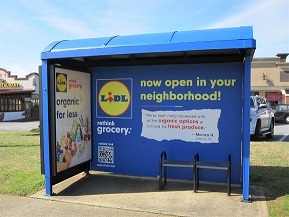 Atlanta Sales Manager Valerie Green began stalking the Lidl marketing folks last fall and successfully landed a nice contract for a dominant grand opening shelter campaign that included 50 shelter faces and 25 complete shelter wraps. The wraps have created quite a stir in the area with bright, bold colors and imaginative creative that cannot be missed by local traffic. The Lidl creative team did a wonderful job. Kudos to Valerie and the Atlanta Ops team for making this initiative a reality. It took a lot of planning and work to get the wraps done in mostly cold and rainy weather. But, the efforts of all reflect a dynamic Street Media program.